Barbara began dancing at the age of 7 years and trained in all styles of Theatre Dance up to Professional level, covering many facets of Dance as a competitor, teacher, choreographer and adjudicator. She was Principal of her own very successful school for 47 years, during which time many past pupils achieved high accolades including scholarships, finalists in Miss Dance, National Championships and the World Tap Championships. Barbara is particularly proud of her pupils who are now Fellow Examiners of the IDTA. Barbara examines for the IDTA in the UK and Overseas and from the 1970s to the present day she has been involved with the updating and choreographing of new syllabus work. Early in her career Barbara was privileged to become an Adjudicator Member of the British & International Federation of Festivals and Member of the All England Dance panel. Barbara has had many years experience of Committee work including the Board of Directors, Chairmanship of the Tap Faculty, Member of the original Quality Assurance Panel and Overseas Committee. She was recently involved in the setting up of a workshop in Spain and is keen to assist members overseas and keep them “up to date” with all the latest IDTA syllabus work. She was very honoured to be the recipient of two Carl Alan Awards, in 2002 for outstanding services to Dance and in 2014 for Lifetime Achievement. In 2007 she was awarded the Classique de Danse Professional Thetare Award and in 2011 the IDTA Distinguished Service Award. In 2014, as an IDTA delegate, she was elected President of the Theatre Dance Council International which annually presents the Carl Alan Theatre, Freestyle and Street Awards. In 2011 Barbara, with the support of the IDTA, launched the BSICA. A choreographic award to promote and encourage young aspiring choreographers. This Award, which covers all Dance genres, is now in it’s fifth year with the finals being held in Manchester. Working on diverse Committees, in many aspects of Dance, Barbara is fully aware of the continual changes in the Dance world, ballroom and theatre, and is always willing to listen to and help Members with the promotion of IDTA Dance in their schools and colleges. Being fully committed and dedicated to the IDTA, Barbara has the time and energy to devote to the continued success of the Association and benefits for its Members. John Knight is a Past President, Fellow and Examiner and was appointed Director Emeritus of the IDTA in 2016. John, like other past presidents, is able to draw on an intimate knowledge of the workings of the organisation and has a personal interest in its members' activities and successes. He is a three times past president and has been fully involved in the work of the Association for some years. The experience gained serving on numerous committees of the Association and British Council has given him a wide experience, he believes in pursuing good causes and looks to anticipate change for the good. During his career John has received three Carl Alan Awards the first two presented by members of the Royal Family. He maintains the second one really belongs to his late wife, Joan; it was given jointly for Formation Coaches of the Year. John was proud to receive his third Carl Alan Award for Services to Dance, presented by the president at that time, the late Dennis Drew. John is very proud to have received this award from Dennis who is sorely missed by all who knew and worked with him. John and Joan were also extremely delighted to have received the IDTA Distinguished Service Award. John's school in Wednesbury still has a full range of activities from social beginners upwards. The school supports the medal test system in full with three sessions or more a year using all branches ranging from rosettes upwards and now, as an addition is taking on board Ballroom and Latin Grades examinations. He feels success in a school of dancing depends on hard work, an appreciation of customer needs and a massive sense of humour! John prefers to look forward to the challenge of the changing future. He has the attitude that optimists live longer than pessimists. Always aware that she is a descendant member of the famous Lupino family, Pat has been a member of the IDTA since its amalgamation with the Empire Society, and previously was a full member of the Empire. During her time as a vocational student at the Nina Hodgson School, she also had Ballroom lessons. Several years in showbiz followed with Prince Littler and George & Alfred Black (the Andrew Lloyd Webbers of the day), then onto being head of The Lupino School of Dancing in Bury. She enjoyed many successes with pupils, including; IDTA Scholarship winners, Championship titles, West End productions, contracts with major Ballet companies and pupils working abroad and on cruise ships. Now there are many previous pupils, Members, Fellows and Examiners of the IDTA with successful schools themselves. Pat has held many successful positions in the world of dance and has worked as a Director on the board of the IDTA for over 15 years. Pat is an IDTA Examiner, Adjudicator and Lecturer for British Federation and All England. She is also the organiser of the annual IDTA Theatre Dance Festival, Director of the All England Dance, and a member of the Royal Academy of Dance. Pat was a recipient of a Theatre Carl Alan Award and the Classique de Danse Awards in 2007. In 2013 Pat was honoured and delighted to receive the Distinguished Service Award from the IDTA. A Board member since 1981, Jane has over 45 years experience in the public and private sectors of industry, running a large and successful dance centre and training thousands of medallists, competitors and professionals up to and including examiners. Fully supportive of the modular system, she encourages many of her busy clients to adopt this method of examination. Continuing professional development is high on her agenda. A Fellow and Examiner in all Ballroom branches, Lecturer, Adjudicator and Scrutineer, she is a member of many committees both technical and strategic. She is constantly thinking of new ideas to promote dance in all its forms and was a founder member of the Rosette committee, Nationwide Committee, Examinations Board and introduced the highly successful Stardance Awards. She is actively involved with the Dance Proms, held annually at the Royal Albert Hall, a unique event to promote dance in every genre for young people. The revision of the Guy Howard technique and new DVDs has received international acclaim and she is proud to have chaired the Ballroom Faculty through the majority of its production. She cannot praise too highly the dedication shown by the faculty. A Justice of the Peace for 35 years, she travels extensively and has many outside interests. Jane always tries to bring the right balance of skill and experience coupled with integrity and independence to Board and other meetings and contributes fully in decision making at all levels. She is open and accountable to you the members. After graduating with a BA (Hons) degree in Economics in 1989, Elizabeth moved to Brighton and worked for Lombard North Central and BT plc before joining the IDTA in October 1993. After graduating with a BA (Hons) degree in Economics in 1989, Elizabeth (Liz) moved to Brighton and worked for Lombard North Central and BT plc before joining the IDTA in October 1993. 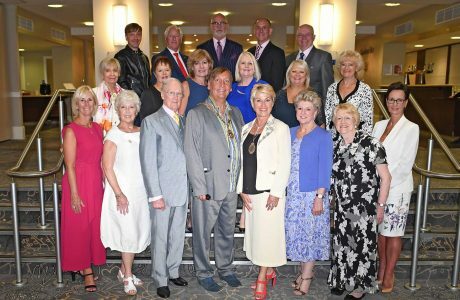 Over the years, Liz's role at the IDTA had changed with key areas being the Association's two annual national conferences, examiner appointment and training, the Dance International magazine and publications and supporting the Board of Directors and sub-committees. With the Association's recognition by Ofqual, Qualifications Wales and the CCEA in 2011, Liz took on the role of Quality Assurance Manager, working closely with the IDTA's regulatory consultant, Rachael Meech. Liz was appointed as the IDTA’s Chief Executive by the Board of Directors with effect from 1st June 2017.